I thought it quite amusing when people would ask me if I were loosing it, simply because I was starting a web solutions business at the beginning of the Dot-com Crash. Even a small number of my customers were questioning if my thinking was a little more then optimistic. I asked, "What does a dot-com crash have to do with starting a web solutions business?" Needless to say, it was surprising to discover how many didn't realize the Dot-com crash had nothing to do with what I was doing. Today, most people are still trying to familiarize themselves with the Internet. Still in its infancy, there is still much to learn. Compare a website today from what you would have seen 10 years ago or even five years ago. Internet technology grows at a pace that is incomprehensible to most. 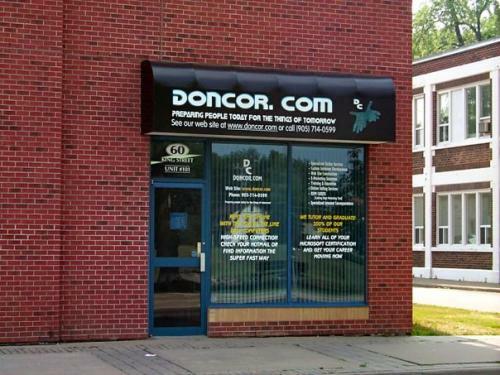 I founded Doncor.com in March of 1999 providing all kinds of Internet services. Are most profitable service required by our customers back then was merely an Internet correspondence service. Yes, email. That's what our customers needed and that's what we provided. They would bring everything from tight to hand written letters and even cassettes with recording. We would type of these e-mails and send them off for a mere $60 per e-mail. Attaching a digital photo? No problem that'll be another $60. $120 for an e-mail? Absolutely it was a service they needed and I provided. According to those customers it was a service well worth the price. 6 to 7 times a week of fellow walk-in with a pair of shoes or purse that he was going to export to Australia. I would take a digital photo undressed to the attention of John Doe attached the photo and send it. $120 later that customer was extremely excited and very grateful. Competing with other web developers? As we transitioned our business into developing websites we just couldn’t see that resulting in a lasting solution for the customer, so why look at what our competitor was doing? It just isn’t enough. Instead we chose to looked at what our competitors were not doing for their customers. That is why our mission and vision is so simple. “Preparing people today for the things of tomorrow.” It is what we are doing now and what we will be doing in the future. As a young executive assistant, working in an advertising company, it was always beneficial to consider what my superiors next move was. It became apparent to me, that I could be much more appreciated and valued if I could help my superiors be more effective by the way I served them. Sure it would be good to look at what is current. However determining what would be next would equal a heap more success, than doing a little better than our competition. If we could practice looking into the future and imagine what might be next, we could set the pace instead of following an old beaten path. I'm creating a future with a principle that brings more success to those I serve, simply because I helped them get ready for the next step. Some would say it is just too simple, but that is the beauty of this vision. Preparing people today for the things of tomorrow, gives my customers an edge that is far more than what the competition is doing. Coupled with a values system and a strong team we chose that we would serve our customers with integrity and powerful solutions that would last into the next evolution of technology.